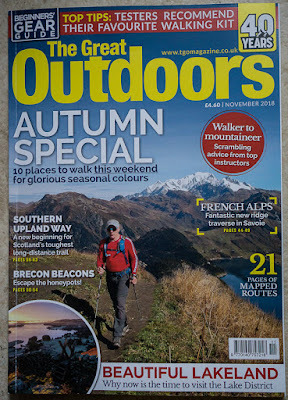 The latest issue of The Great Outdoors has just been published. In it I describe the gear I used on my walk through the Alps on the GR5 Trail, a venture I finished just a few days ago. The piece was written eight days into the walk, when the weather had been warm and mostly sunny, though with some thunderstorms and torrential rain. The next three weeks did see colder weather and some strong winds and more prolonged rain. How did the gear hold up? I'll be writing about that soon. 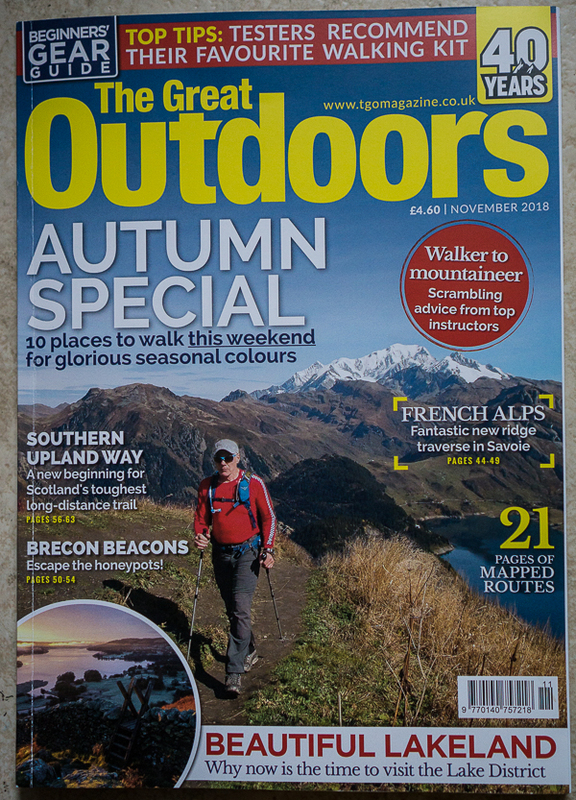 Also in this issue there's a Beginners Gear Guide in which I make recommendations for day walking and backpacking gear and Judy Armstrong looks at gear for women. The shortlists for the TGO Gear of the Year are announced. These come from products put forward by gear companies. Over the next few weeks I and the other five judges will be testing the products and deciding the winners in each of the seven categories. The issue opens with a superb moody and evocative double page spread of dawn in Torridon by James Roddie. Further into the magazine Roger Smith considers the problem of vehicle tracks in the hills and looks at the recent excellent LINK Hilltracks report Changing Tracks. Jim Perrin gives a portrait of Bleaklow - 'one of the truly marvellous places in the British hills'. David Lintern traverses vast Ben Avon in the Cairngorms and has a cold camp high on the mountain. Judy Armstrong walks an unnamed ridge in the French Alps. In South Wales Phoebe Smith walks the little known Bwlch with Altitude circuit. Further north in Southern Scotland Ronald Turnbull undertakes the relaunched and in some places rerouted (a road section has been replaced with one over the Ettrick Hills - hurrah!) Southern Upland Way - 'the toughest waymarked trail in Scotland'. Just to the south in the Lake District photographer Dave Fieldhouse shows the changes in the seasons in a glorious photo essay. Finally, Sandy Paterson of Glenmore Lodge gives advice on scrambling. I am really looking forward to reading about the relaunched Southern Upland Way. I walked it in May this year and took the new section over the Ettrick Hills, I have to say it is a lot better than the original forest track section but it does not replace a road section. I am pleased about this improvement but would rather see the removal of the intergalatic size windfarm which now has destroyed any sense of enjoyment on the walk between New Luce and Bargrennan. I have to say that if you want solitude on a long distance walk the SUW is the one to do, I was the only backpacker and I saw one other walker who was having his gear ferried between accomodation.